Rep. Keith Ellison (D., Minn.), the Democratic candidate for attorney general in Minnesota, said in a debate Sunday night that his views were "incompatible" with Louis Farrakhan's despite having continued to associate with the Nation of Islam leader over the years. During the televised debate between Ellison and Republican nominee Doug Wardlow, the GOP candidate accused Ellison of being an extremist, pointing to his history with Farrakhan. Farrakhan is the national representative of the Nation of Islam. The Anti-Defamation League described the organization as having "a consistent record of anti-Semitism" since the 1930s. Farrakhan called Jews "termites" earlier this month, and has called Hitler a "great man." Chelsea Clinton called on Democrats to condemn Farrakhan following his "termites" comment, though her father recently shared a stage with him. Leaders of the Women’s March have refused to condemn Farrakhan. Ellison, who is also the Democratic National Committee deputy chairman, admitted Sunday that "in the early 1990s" he thought Farrakhan "had some things I thought he had to offer." The Minnesota Democrat said he realized soon after, however, "his views and mine were absolutely incompatible, and I have been saying that ever since." During the debate, Wardlow claimed Farrakhan had "never denounced Louis Farrakhan." Ellison has publicly attempted to separate himself from Farrakhan's radical views, and he did so again during the debate. His private record, however, is another matter. The Washington Post gave Ellison "Four Pinocchios" for falsely claiming that he cut ties with the homophobic Farrakhan. 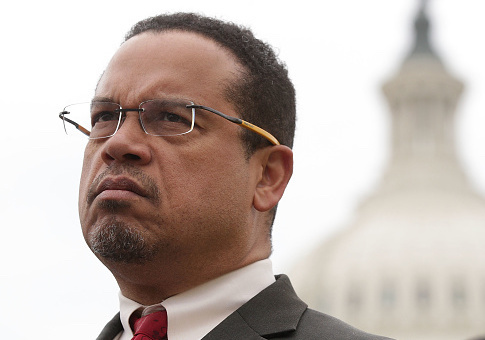 CNN’s Jake Tapper has criticized Ellison for his ties to the minister, saying "People want to have the association, but they don't want to get dinged for it publicly." Ellison and Farrakhan have been together at least three times in recent years, long after Ellison purportedly cut ties. In 2013, Ellison attended a dinner with both Farrakhan and Iranian President Hassan Rouhani. Farrakhan and Ellison are seen in a September 2013 video, standing just feet apart in Virginia’s Dar Al-Hijrah Islamic Center. Farrakhan revealed in a 2016 video that he had privately met with Ellison as well. Farrakhan said he also met with Rep. André Carson (D., Ind. ), and once the meeting's existence was out in the open, Carson admitted they met. Ellison repeatedly refused to address the allegation, including during a February CNN interview. This entry was posted in Issues, Politics and tagged Anti-Semitism, Keith Ellison, Louis Farrakhan, Minnesota. Bookmark the permalink.